The founder and original proprietor of the business was Dr Peter Fahrney. 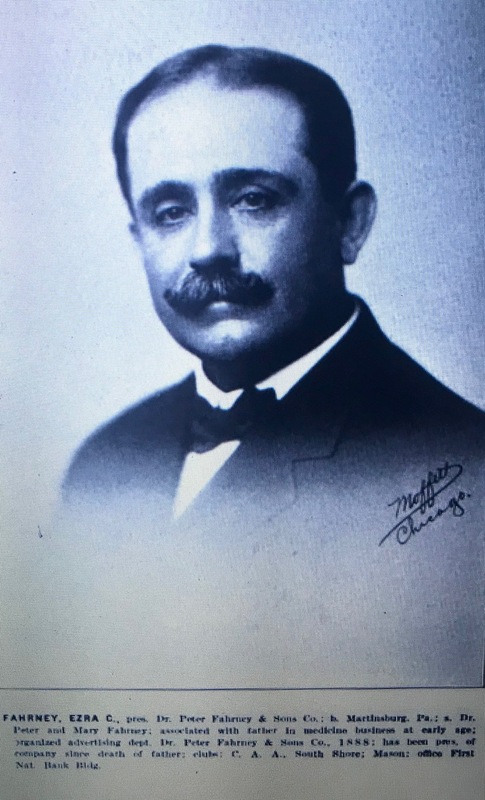 He, along with his his four sons, named Ezra Camerer, William Henry, Josiah Harvey and Emery Homer all had significant roles in the growth and management of the business over the years. A section featuring Dr. Peter Fahrney was included in a publication entitled “Notables of the West – Being the Portraits and Biographies of Progressive Men of the West Who Have Helped in the Development and History Making of this Wonderful Country, Vol. 2” published in 1915. The following information from this feature provided some facts and insight into his early life and the beginnings of his company. Dr. Peter Fahrney, Proprietary Medicines, Chicago, Illinois, was born near the village of Quincy, in Cumberland Valley, Maryland, February 2, 1840. His grandfather, (also named) Peter Fahrney, over a century ago acquired fame as a noted herb practitioner, who wandered afoot over Pennsylvania and into Maryland and Virginia in the practice of his profession. He was familiarly known as the ‘Little Dutch Doctor,” and one of his special preparations which he devised as a blood cleanser became eminently successful as far as it became known…His son, Jacob, the father of Dr. Peter Fahrney…devoted most of his time to the dispensing of the herbs his father had perfected and upon which he also improved and made advancements. Determined to follow in the footsteps of his father and grandfather, Peter Fahrney entered Jefferson Medical College at Philadelphia, after which he took a course in chemical and pharmaceutical training at the Philadelphia School of Pharmacy. This step is explained by the statement that he had made up his mind that a capable pharmacist, grounded in all the details of apothecary craft, would be enabled to present the world in convenient form the remedies that made “old” Dr. Peter his reputation. The younger Fahrney began his practice at Morrison’s Cove, in Blair County Pennsylvania and later moved to Franklin County, Maryland, where he took over the practice of his cousin, Dr. John Burkholder, who had become ill and incapacitated. By this time he had begun to manufacture patent medicines and had achieved some success when the Civil War forced his move to Illinois. Dr. Fahrney had achieved notable success when the rebellion broke out. In the sweep of armies through the Cumberland, his native city was put to the torch and his fortunes broken. He then removed to Ogle County, Illinois, where he enjoyed a reasonable share of prosperity. In 1869 he arrived in Chicago. He located at what is known as the North Side, securing a site for a laboratory in the section of Chicago just north of the river, his plant one of the first to be located on North Dearborn Street. He was well on his way to notable success when the fire of 1871 came and laid the building in ashes. With indomitable spirit he resumed operations within a few days and was soon again supplying his remedies to all parts of the country. A new location was found on South Hoyne Avenue, on the West Side and within a few years the business had reached the proportions of a national enterprise. The Chicago directories confirm and add to this information. The address given for P Fahrney in the Edwards Chicago Directory (containing names and locations up through Dec 12, 1871) was 431 W. Lake, late 30 N. Dearborn. So based on this listing it looks like he resumed business on Lake Street after the fire destroyed the location on Dearborn . 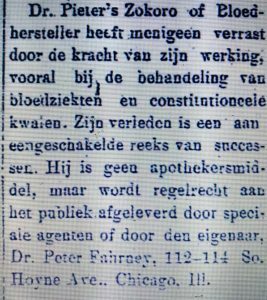 Subsequently, the directories between 1872 and 1885 that I can find listed Peter Fahrney as “patent medicines” but only provided a residential address for him. This leads me to believe that the Panic of 1873 and resultant depression impacted the growth of the business in all or part of this time frame but I haven’t been able to confirm this. Around the same time, the business relocated to 112-118 Hoyne Avenue. By then, three of his four sons were involved in the business. In addition to naming Peter Fahrney as the president, the 1891 Chicago Directory named Ezra as the vice president, William as treasurer and Josiah as a buyer. By 1899, Emery was also included in the business listings. According to Ezra’s biography, also included in the 1915 printing of “Notables of the West,” he had been involved in the business from a very young age and had a significant role with the company well prior to the time of Peter’s death. Shortly after leaving college Ezra Camerer Fahrney organized the advertising branch of the business and conducted it to an extent that brought quick success. Several years later he was made general manager, and when, in 1889 the business was incorporated, he was elected Vice President and given a one-tenth stock control. A few years thereafter he virtually became the guiding hand of the company, making and marketing its remedies and shipping them throughout the country. The business grew under his management to vast extent, the laboratory on Hoyne Avenue being today one of the most perfectly equipped plants in the United States. Following Peter’s death, in addition to listing Ezra as president, the 1906 Chicago Directory named Josiah as vice president, William as treasurer and Emery as secretary. The company remained on Hoyne Avenue until the late teens. Around 1910 their address changed to 19 to 25 S Hoyne Avenue but this was apparently caused by the renumbering of Chicago’s street system and not the result of a physical relocation. By 1920, they had moved to 2501 West Washington Boulevard. At some point, they also established a factory in Winnipeg, Canada. Ezra remained president until his death in 1930 after which Emery assumed the presidency until 1935 when he also passed away. William (1920) and Josiah (1922) had previously passed away so at this point, according to a story in the October 8, 1935 edition of the Ironwood (Michigan) Daily Globe, the business passed in trust to Emery’s family. Emery Homer Fahrney, of Oak Park, who died last night at his summer home near Oshkosh, Wis., was president of the Peter Fahrney Drug Company, founded by his father, who left an estate estimated at $2,000,000. The patent medicine fortune founded by Peter Fahrney will go now, it is reported, to his granddaughters, Merry and Myrtle, under the terms of a trust. Ultimately his widow, Mrs. Marion Fahrney Hardeen also shared in the estate. Management of the company after Emery’s death is not clear to me but apparently the company remained in Chicago well into the 1960’s. In 1952 they purchased a building on N. Ravenswood Avenue. The purchase was reported in the June 22, 1952 edition of the (Chicago) Suburbanite Economist. 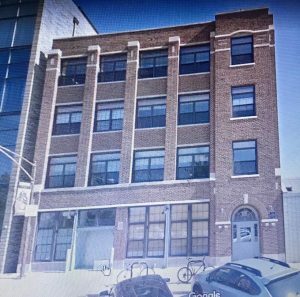 Dr. Peter Fahrney and Sons Company, 2501 Washington, has purchased a building fronting on N. Ravenswood Ave., near Wilson Ave. The firm is a producer of proprietary medicines. Advertisements as late as 1964, this one printed in the October 4, 1964 edition of the Palm Beach (Florida) Post, included their address as 4543 N. Ravenswood, Chicago. Whether or not they also retained the Washington Blvd location after 1952 is not clear. …Thus does the discovery of Dr. Peter’s Blood Vitalizer by old Dr. Peter Fahrney date back into the past century. During its existence, hundreds of so called medical discoveries have sprung up, only to be cast aside and forgotten, because they could not stand the test of time, but the Blood Vitalizer has held its well-earned place in the field of medicine, and is today without a rival as a family medicine. 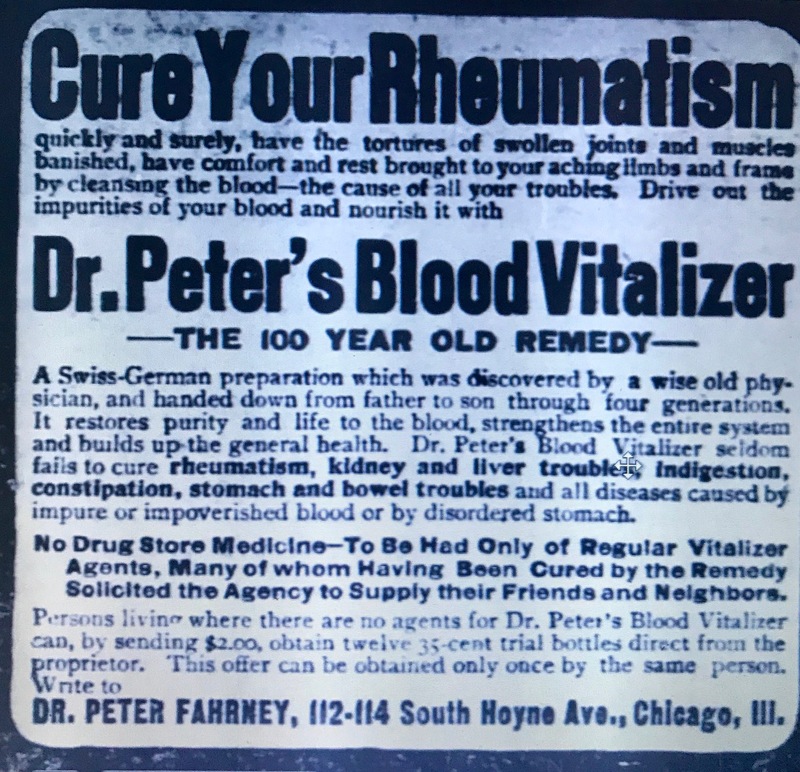 Another advertisement, this one from the March 14,1901 edition of the National Tribune provides a list of diseases supposedly cured by Dr. Peter’s Blood Vitalizer. Dr. Peter’s Blood Vitalizer seldom fails to cure rheumatism, kidney and liver troubles, indigestion, constipation, stomach and bowel troubles and all diseases caused by impure or impoverished blood or by disordered stomach. 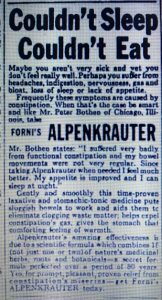 Around this time, the product was also being marketed in German newspapers as Forni’s Alpenkrauter (sometimes Alpenkraeuter) Blut Beleber (Translated: alpine herbs blood animator). The following two advertisements are from German newspapers; one from the November 21, 1890 edition of the (Hermann Missouri) “Hermanner Volksblatt” and the other from the May 20, 1897 edition of the (Topeka) Kansas Stats-Anzeiger.” The Dr. Peter Fahrney name and address are clearly visible at the bottom of each advertisement. According to a publication entitled “A Mile Square of Chicago,” in addition to Forni’s Alpenkrauter, the product also appeared under several other names according to the nationalities to which it was advertised. The names mentioned in the publication are: Hoboko, Novoro, Zokoro, Kuriko and Gomozo. 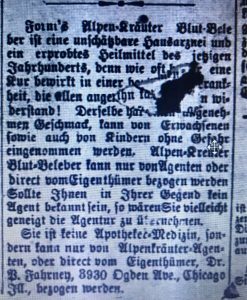 Newspaper advertisements from the late 1800’s and early 1900’s appear to bear this out. 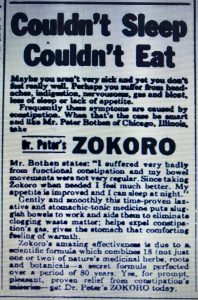 I’ve seen advertisements in that era for Novoro, Zokoro and Gomozo. The advertisements appear to be in French, Dutch and Polish respectively. 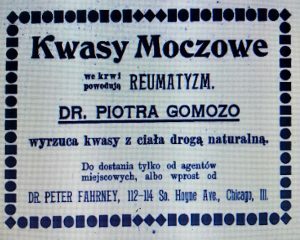 The Dutch (March 28, 1900 Sioux Center Iowa News) and Polish (July 3, 1901 Chicago Telegraf) advertisements are shown below. Regardless of the name presented, advertising from that time typically stressed its natural ingredients. Composed exclusively of herbs, roots, leaves, barks, etc., it is nature’s true medicine, unaltered, as nature does not change. The human constitution is the same today as it was one hundred years ago. It is subject to the same troubles and ailments, and the Blood Vitalizer demonstrates to the living generation its effectiveness, as well as it did to those of the past. What the advertising failed to mention was the fact that it contained 14% alcohol. In fact, this advertisement from an 1893 issue of the Farmers’ Review, would have you believe that your “glow of vitality” was not intoxication but the result of a cleansed and revivified system. “A Spades a Spade” – The saying is a true one. Yet there never was a greater tendency to call things by their wrong names then now. Whisky by any other name is just the same – it isn’t any more invigorating to the blood if you call it “bitters” than if you call it whisky. Intoxication may be easily mistaken for the glow of vitality – but it’s not. Dr. Peter’s Blood Vitalizer is an herb root remedy for all blood troubles – it cleanses and revivifies the entire system. You couldn’t get drunk if you drank a barrel of it. It has successfully stood the test of more than one hundred years of popular use. Don’t ask your druggist. It can be had of local retail agents only. Write Dr. Peter Fahrney, Chicago. $1.25 per pint for a mild laxative and alcoholic stimulant, made palatable by the presence of a little sugar, ought to furnish a pretty good profit for the manufacturers, with very little likelihood of any great permanent benefit to the users of the preparation. With the advent of National Prohibition, “an alcoholic stimulant made palatable by the presence of a little sugar,” was certainly in great demand. 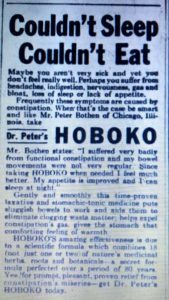 Apparently available during the prohibition years as a medicinal product, it was advertised in the newspapers throughout that period. This item, promoting an establishment called George Tuch’s Place in the September 12, 1924 edition of the (Riverdale, Illinois) Pointer, looks like a rather thinly veiled advertisement for a club serving alcohol in the form of Fahrney’s Alpenkruter. 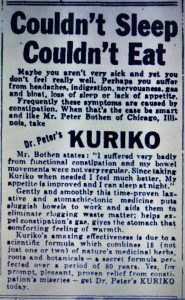 By the late 1940’s, most of their advertisements continued to promote Peter Fahrney’s reputation as a doctor and to mention that the product was composed of medicinal roots and herbs, but the description of expected results had been toned down quite a bit. 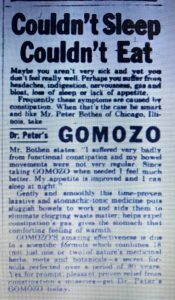 This advertisement from a February 13, 1949 edition of the New York Daily News, which actually contained a picture of Peter Fahrney, was pretty typical. 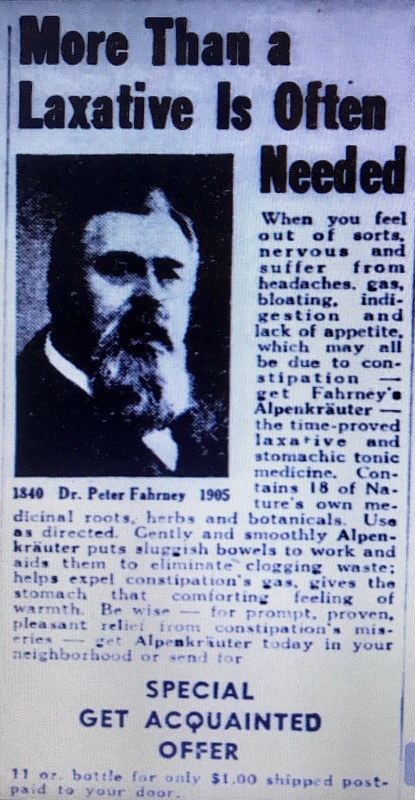 …get Fahrney’s Alpenkrauter – the time-proved laxative and stomach tonic medicine. Contains 18 of Nature’s own medicinal roots, herbs and botanicals. Use as directed. Gently and smoothly Alpenkrauter puts sluggish bowels to work and aids them to eliminate clogging waste; helps expel constipation’s gas, gives the stomach that comforting feeling of warmth. Based on newspaper advertisements, the preparation was still being marketed up through the 1950’s and early 1960’s. By then the advertisements were predominately, if not entirely, published in english but the various names under which it was sold survived. This series of advertisements appearing between 1954 – 1955 used the same advertising copy to promote the product under several of its various names. According to Yelp.com, today 2501 W Washington Blvd is a five story, 68,000 square foot building built in 1920. Peter Fahrney & Sons began listing it as their address around the same time, making them the original tenant. 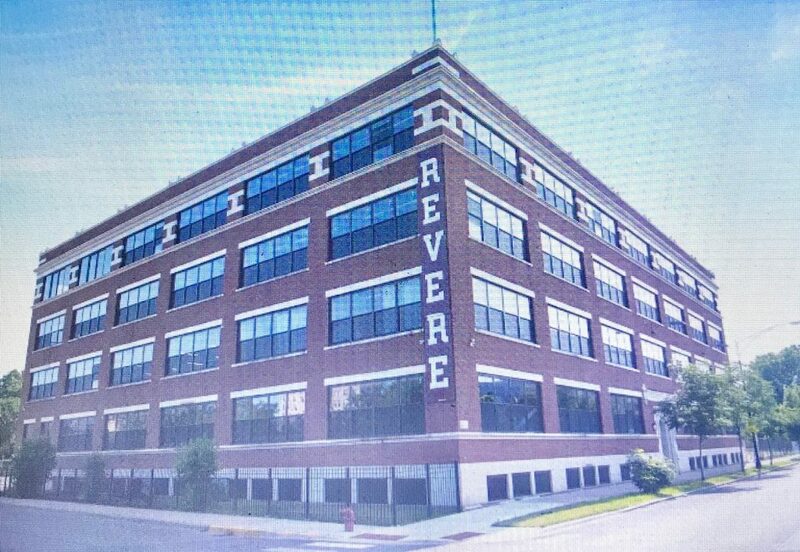 As far as I can tell, a catering business called the “Revere Loft” currently occupies the top floor with the remaining floors vacant and for rent. Building information for 4541 N Ravenswood Ave. presented on realtytrac.com states that it was built in 1927, so it is certainly the building Peter Fahrney & Sons purchased in 1952. 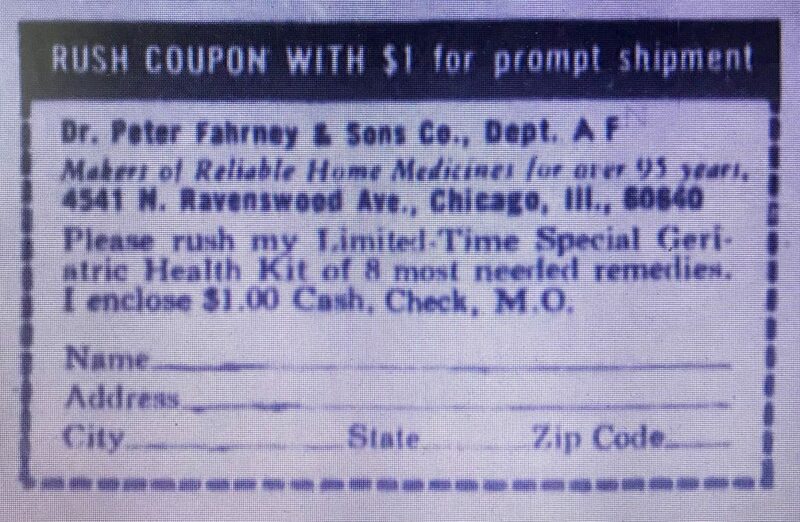 The bottle I found is a machine made, square, roughly pint sized medicine embossed on one side: “Prepared By Peter Fahrney & Sons Co. Chicago, U.S.A.” The other side is embossed: “The Reliable Old Time Preparation for Home Use.” This leads me to believe it contained “Dr. Peter’s Blood Vitalizer.” Under what name? Your guess is as good as mine.